Continuing the blog series on Flow Science’s 35th anniversary contest, I will cover the case study from the winner of the contest, Daniel Valero Huerta from FH Aachen University of Applied Sciences in Germany. His research focuses on understanding the dispersion of contaminants/discharges in rivers and estuaries. In this research, FLOW-3D has been extensively used as the computational model for studying the turbulent dispersion of the discharges. Environmental discharges and outfall structures have been traditionally designed by means of complex, cost-intensive and time-consuming experimental studies. Models based on an integral approach are commonly employed despite their limitations, but contaminant re-entrainment or strong adverse discharges fall outside the hypothesis of such models. Thus, using a full 3D model for contaminant dispersion may improve knowledge on the real contaminant dispersion in rivers and estuaries. Similarly, bounded jets can be modeled and different diffusor locations can be tested in order to improve the overall environmental water quality and biotic conditions. In this study, a jet discharge was modeled both experimentally and numerically. Then, an estimation of the turbulent dispersion in the shear region was obtained. For the turbulence modeling, the Renormalized Group (RNG) model was employed together with the TruVOF method for tracking the free surface. A monotonicity-preserving, second-order scheme was employed for contaminant advection ensuring proper modeling of turbulent transport. FLOW-3D is a very good choice for the numerical modeling of such engineering problems because it offers a comprehensive turbulence modeling suite and accurately estimates the free surface. Another advantage of FLOW-3D is the ability to use a one-fluid approach because modeling air (a two-fluid problem) is not important for river contaminant transport problems for practical applications. One-fluid modeling is a more natural, and efficient approach for hydraulic problems. Figure 1 shows a snapshot of the simulation results. Figure 1. Top view (top) and side view (bottom) showing the discharge ejected from an outfall. Complex flow patterns are seen along with circulation zones between groins (pink blocks). 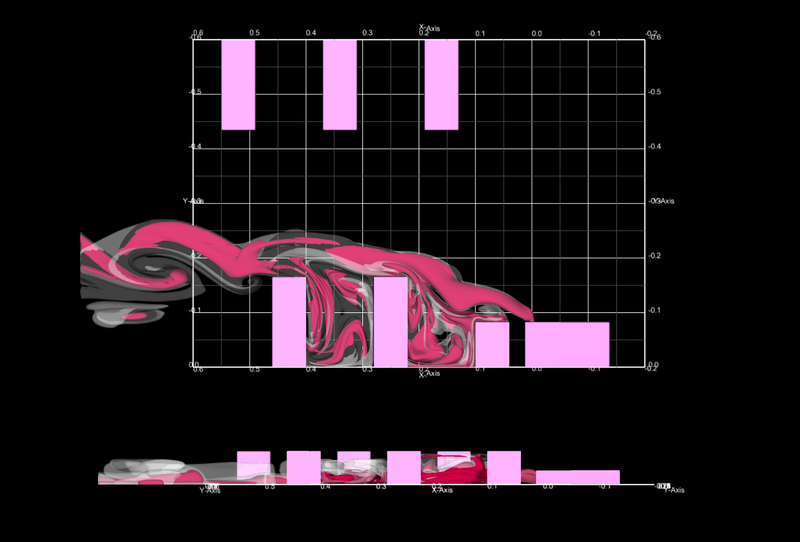 FLOW-3D offers a comprehensive set of turbulence models. They can be broadly divided into two categories – Reynold’s Averaged Navier Stokes (RANS) models and Large Eddy Simulation (LES) models. As the name suggests, RANS models average out the fluctuating quantities in the governing equations. LES models, on the other hand, solve for the turbulent motions at scales resolved by the mesh. RANS models are good for understanding the average behavior of a flow over a period of time, while LES models are used to describe individual experiments or significant transient behavior. For this study, the RNG model, which falls into the category of RANS type models, was used. RNG is an improved k-ԑ model, with coefficients determined through rigorous statistical analysis. Other options that could have been used as RANS models are the classical k-ԑ model or the Wilcox k-ω model. RNG was chosen because it is typically good for transitional flows. FLOW-3D uses an enhanced variant of Volume-of-Fluid (VOF) technique called TruVOF®. TruVOF provides a natural way to capture free surfaces and their evolution with great efficiency. More details on the free surface fluid flow can be found here. FLOW-3D offers three options for momentum advection based on the order of accuracy desired. The first order is the simplest and fastest method. The second order is preferred for minimizing numerical dissipation. The third option is called second order monotonicity preserving. This method is second order accurate in space and first order accurate in time. It was used for this study to properly model the turbulent transport of the contaminant. Preservation of monotonicity ensures that the quantity gradients are limited to avoid non-physical oscillations. The animation below shows that the upstream channel flow deforms the jet, pushing it to the side groin fields where re-circulation takes place. Simulation showing the deformation of the jet and circulation zones in two different views. This bounded jet shows unsteady behavior even for the statistically steady final solution. For ease of visualization, two iso-concentration surfaces are shown: C=0.01 (red) and C=0.001 (grey), which act as a representative envelope of the contaminant reach. The grid space was set to 5 cm for visual comparison with the experimental results (see animations below). We see that FLOW-3D captured all the relevant physics important in modeling turbulent dispersion of environmental discharges. The results match the experiment to a good degree of accuracy both visually and numerically. In my next blog, I will be talking about another entry from our 35th anniversary simulation contest, which focuses on modeling Pelton turbines.